!. Once your Notability file is complete, tap on the share icon in the top-left corner of the screen. 2. Choose the "Share..." option that appears at the bottom of the destination window. 3. 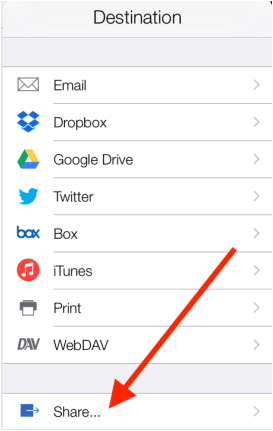 Make sure the document format is "PDF" then tap the blue "Share Note" button. 4. A new window will appear on the screen. 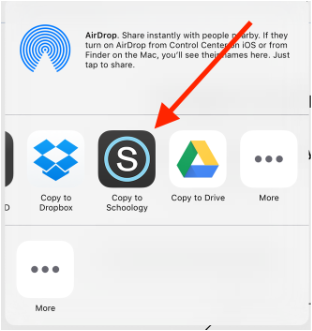 Swipe through the apps until the Schoology icon appears. Choose "Copy to Schoology." 5. This will automatically redirect you to Schoology. Schoology will then take you through a series of menu screens, from which you will choose the destination for your document. Choose "Submit to Assignment" and then continue with the prompts to locate the class and name of assignment to which you wish to submit your file. 6. When you locate the name of your assignment, you will then finally be prompted to upload your submission. Choose "Upload." Schoology will then let you know when the file has successfully submitted to the assignment.